We help you find quality direct investments in real estate assets that have been sourced, vetted, and structured in accordance with SEC Regulation D 506c and Regulation S. As a Fund Manager, you can perform research and subscribe to offerings that meet your investment criteria. Regardless of your investment experience, we recommend that you consult with your Accountant or Lawyer to determine which if any of the investments you review are right for you before investing. 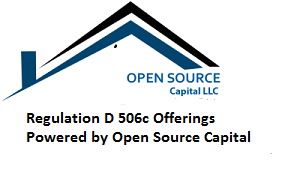 In order to invest in a Regulation D Rule 506c securities offering, you must be an accredited investor. We help Sponsors acquire both Equity and Debt. These investments together, have the potential to improve an investor’s portfolio overall performance while reducing volatility. We support Sponsors with investor-centric projects and review projects on the merits of the deal, the probability of success, and their fit within our strategy. We have the ability to provide initial feedback to sponsors quickly and can help them structure their deal to meet our criteria for risk mitigation, a fair waterfall and a clear picture of an investment’s economic potential. Typically, qualifying investments will have quarterly income streams, substantial profit participation and priority returns to investors. We work with only experienced management teams that provide deals to sophisticated investors. Our Clients offer a broad range of real estate investments ranging from new construction to triple net leased income producing properties. Section 201(a) of the JOBS Act requires the SEC to eliminate the prohibition on using general solicitation under Rule 506 where all purchasers of the securities are accredited investors and the issuer takes reasonable steps to verify that the purchasers are accredited investors. has a net worth of over $1 million, either alone or together with a spouse (excluding the value of the person’s primary residence). a method for verifying the accredited investor status of persons who had invested in the issuer’s Rule 506(b) offering as an accredited investor before September 23, 2013, and remain investors of the issuer. This website is neither an offer to sell nor the solicitation of an offer to buy any security. Only the Private Offering Memorandum can make such an offer. Therefore, a copy of the Private Offering Memorandum must be made available to you in connection with the offering. This advertising material must be read in conjunction with the Private Offering Memorandum in order to understand fully all of the implications and risks of the offering of securities to which it relates. Private offerings are NOT certificates of deposit or similar obligations guaranteed by any depository institution and are NOT insured by the Federal Deposit Insurance Corporation (FDIC) or any governmental or private insurance fund, or any other entity. To understand a private offering fully, you should read the entire Private Offering Memorandum carefully, including the “Risk Factors” sections, before making a decision to invest. Some of the more significant risks include the following: servicing of the Investment depends upon the Sponsors ability to manage the business and generate adequate cash flows; the Investments are risky speculative investments; there will not be any market for the Investments; there is no assurance that any Investments will be sold; you will not have the benefit of an independent review of the final terms of the Investments; payment on the Investment is dependent on the Sponsor. If the Sponsor loses or is unable to retain key personnel, he or she we may be delayed or unable to implement the business plan; and will have a limited operating history and limited experience operating as a company and our business is not diversified. It is important to note that Private Offerings are complex and best intended for sophisticated investors, and may have high costs of ownership, such as origination and brokerage fees. Private Investments carry certain unique risks which should be carefully considered and fully understood by individual investors before investing. Online Real Estate Investments are offered via a Private Placement Memorandum. You can request these documents by sending an email to the Sponsor or their broker/dealer. Carefully review these documents prior to making an investment decision. Risks may include loss of principal or the possibility that at expiration the investor will own the reference asset at a depressed price. Securities discussed in this material are not registered with the SEC but are issued pursuant to an exemption from registration. Before Investors make any investment, they should read the prospectus and preliminary pricing supplement and all relevant offering documents for complete information about such issuer and the securities being offered. Investors should understand the characteristics, risks, and rewards of each Investment as well as those of the reference asset before making a decision to invest in the security. Investors should contact their own accounting, tax or legal advisors to review the suitability of any investment. Investment are issued as non-registered securities. Non-registered securities are exempt from SEC registration and are issued under the JOBS ACT, Regulation D, Section 506(c). Your ability to sell or transfer your Security is limited; no market currently exists, nor is one expected to develop. Securities laws restrictions apply to private Securities. Proposed transferees of Private Securities must be Accredited Investors. Consent of the Management to a transfer is required and may be withheld at the Manager’s discretion. You must place total reliance on the Manager for operating the Company. The Manager is subject to Conflicts of Interest with the Company. Investments in a business loan carry risks; for example, defaults can occur in payments to be made by the Equity Entity. The Borrower may be involved in a small real estate construction and development project. Small construction and development projects are higher risks than other secured transactions. In almost all cases, the Equity Entity uses leverage (borrowed funds) that are senior to the Equity, which increases the Company’s risk in the event of payment default by the Equity Entity. In addition, the rights of the Company and therefore the Participants are subordinate to the rights of the Equity Entity’s senior lenders. Return of your investment generally is dependent upon the ability of the property to produce cash flow and the ability of the Entity to repay its senior lender. Some of the factors that may affect the net operating income or value of a property can develop after the Company makes an investment and therefore could not be included in the factors considered in selecting the investment for the Company. Net operating income of the financed project can be volatile and may be insufficient to cover debt service on the Equity Entity at any given time. The potential default of a senior loan, which, if not satisfied, could cause the Company to lose its entire Membership Interest investment. Possible liability for injury to persons and property. Investing in construction transactions is riskier than investing in transactions secured by operating properties or with companies with a long operating history. Appraisals are obtained from certified third-party appraisers on all transactions. However, there is a risk that the appraisals prepared by these third parties are incorrect, which could result in defaults and/or losses related to construction/development loans if the amount realized upon a sale of the underlying property turns out to be insufficient to cover the outstanding loan balance. Because values can quickly decline below their appraised values during the term of the associated Company’s Equity Investment, there is no assurance that the LTV ratios used by the Company will be adequate to protect the Company’s Equity Investment. Material declines in values could result in the Company’s Equity Investment being under-valued and lost. Financial stability of the Equity Entity. It is expected that at least for the foreseeable future the return on equity Note will be structured based on a rate of return. Market interest rates on investments comparable to the Company’s Equity Investments could materially increase above the general level of the Company’s fixed rate base return rate. Risk related to interest rate shifts increases as the length of maturity of a Company Equity Investment increases. The Equity Entity will normally carry adequate hazard and liability insurance for the benefit of the Membership Interest of the Equity Entity. Some events are, however, either uninsurable or insurance coverage is economically not practicable. If an Equity Entity allows insurance to lapse, an event of loss could occur before the Company and other Members know of the lapse and have time to obtain insurance to protect their collective interests. Insurance coverage may be inadequate to cover property losses, even though the Equity Entity purchases insurance that it believes is adequate. Approve a merger or sale of all or substantially all of the assets of the Company. Various federal, state and local laws can impose liability on owners, operators, and sometimes lenders for the cost of removal or remediation of certain hazardous or toxic substances on the property. Such laws often impose liability whether or not the person knew of, or was responsible for, the presence of the substances. Default by a borrower if it must pay for remediation. Any of these could create a material adverse effect on a foreclosed asset and/or transaction profitability. THE INVESTMENTS ARE TIED TO THE PERFORMANCE OF A SPECIFIC INVESTMENT IN AN EQUITY ENTITY. THE COMPANY WILL SELL EQUITY PARTICIPATION INTERESTS FOR EACH MEMBERSHIP INTEREST IN AN EQUITY ENTITY THAT IS BEING ACQUIRED. THE RETURN OF EACH MEMBERSHIP INTEREST INVESTMENT IS DEPENDENT FOR PAYMENT ON PERFORMANCE OF THE CORRESPONDING EQUITY ENTITY. THESE MEMBERSHIP INTERESTS ARE UNSECURED INVESTMENTS. INVESTING IN EQUITY SHOULD ONLY BE CONSIDERED BY PERSONS WHO CAN AFFORD THE LOSS OF THEIR ENTIRE INVESTMENT. You must be an “Accredited Investor” to purchase a participation interest in a Dequity Participation Note. In addition, the Company has restrictions on the resale or transfer of a Participation Interest. A Participant must review the Subscription Agreement prior to executing it, and will be deemed to have made representations as to being an Accredited Investor. The Manager reviews and screens all Subscription Agreements, and rejects Subscription Agreements from investors not meeting the criteria. The Company cannot accept subscriptions from any person or entity where the representations required are either not provided or are provided but inconsistent with the determination that the subscriber is accredited. The Manager has the unconditional right to accept or reject, any subscription in whole or in part for any reason, or no reason. A Participation Interest represents an investment with limited liquidity. You may not be able to liquidate your investment in the event of an emergency or for any other reason. A Participation Interest will be sold to a Participant only if the Participant is an Accredited Investor as defined in the Subscription Agreement. You may transfer your Participation Interest only to persons who are Accredited Investors and only with the consent of the Manager. A Participant must carefully read the requirements in connection with a re-sale in the “No Sale or Transfer of Interests” of the Subscription Agreement. Due to the nature of the Participation Interest, it is likely that all of the income attributable to the return on a Participation Interest will be miscellaneous income taxed at ordinary income tax rates. You should obtain the advice of your attorney, tax advisor, and/or business with respect to the legal, tax and business aspects of this investment prior to subscribing for a Participation Interest. There is no public market for the Equity Participations and none is expected in the future. Participants have only a restricted and limited right to assign their Equity Participations. Holders may transfer their Equity Participations only by written instrument satisfactory in form and substance to the Manager and only to an Accredited Investor. You may make no transfer of an Equity Participation or a fractional Participation, and no transfer in the absence of consent of the Manager (other than a Participant transferring all of his or her Participation by operation of law). Any transfer must comply with then-current laws, rules, and regulations of any applicable governmental authority.